The main symptom is the relentless pursuit of thinness through self-starvation. This may become so extreme that it's life-threatening. It most frequently affects young women, but anorexia is found among both sexes of all ages, and across social and ethnic groups. * Distortions and misconceptions about weight and body size. * Obsession with food and calories. * Isolation, loss of friends. This condition is characterised by overeating followed by self-induced vomiting and sometimes purging with laxatives. It can develop at any age, although it often follows an episode of anorexia. Bulimia can have serious long-term physical consequences, such as damage to the stomach, tooth enamel and vocal cords. * Binge-eating large amounts of food. * Often disappearing to the lavatory after meals. * Feeling out of control. A variety of people treat eating disorders, using different techniques. These include family doctors, psychiatrists, dieticians and, ideally, a multidisciplinary team on a specialised eating disorders unit. Treatment includes self-help approaches and psychological treatments, especially cognitive behavioural therapy, which aims to give people a better understanding of their condition and learn ways to change their behaviour. Getting better is often a long, slow process. For example, 30 per cent of people with anorexia who have apparently recovered relapse in the first year after treatment and need more therapy. As many as 50 per cent recover completely, while another 30 to 40 per cent manage to lead a normal life. 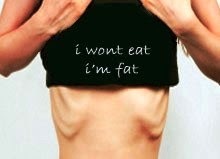 For an in-depth look at eating disorders, including self-help tips, see the Mental health site. For further information about eating disorders, talk to your GP. Thin, Grace Bowman, 2007. An honest account of life with anorexia nervosa. Recommended for anyone hoping to understand more about eating disorders and overcoming addiction. Overcoming Anorexia Nervosa, Christopher Freeman, 2009. The author is one of the UK's authorities on anorexia nervosa and its treatment using cognitive behavioural techniques. Anorexia Nervosa: A Survival Guide for Families, Friends and Sufferers, Janet Treasure, 1997. A self-help book for both families and sufferers offering useful ideas on how to overcome this illness. The Invisible Man: A Self-help Guide for Men with Eating Disorders, Compulsive Exercise and Bigorexia, John Morgan, 2008. A self-help book for men with body image issues and eating disorders. Getting Better Bit(e) by Bit(e): Survival Kit for Sufferers of Bulimia Nervosa and Binge Eating Disorders, Ulrike Schmidt and Janet Treasure, 1997. A self-help manual offering detailed step-by-step advice for those with bulimia. Overcoming Binge Eating: Christopher G. Fairburn, 2009. An authoritative self-help book for anyone who is working alone or with a therapist to recover from binge eating disorder. Skills-based Learning for Caring for a Loved One with an Eating Disorder: The New Maudsley Method, Janet Treasure, Gráinne Smith and Anna Crane 2007. Provides carers with the skills and knowledge needed to support and encourage those suffering. Eating Disorders: A Parents' Guide, Rachel Bryant-Waugh and Bryan Lask, 2004. A straightforward introduction to the subject with practical advice. B-eat is a UK charity for people with eating disorders and their families. There are separate confidential helplines - one for adults and one for young people under 25. Under 25s can also text or chat online to a member of the youth team. Overeaters Anonymous is a fellowship of individuals who, through shared experience, strength and hope, are recovering from compulsive overeating. They welcome everyone who wants to stop eating compulsively.